ARTESIA, Calif. (CNS) — The Rev. 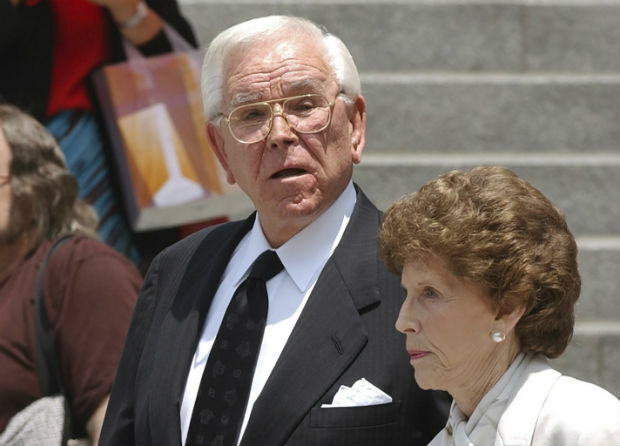 Robert Schuller, a popular Protestant television preacher of the late 20th century who once reached millions of viewers, died April 2 in Artesia at age 88. He had been suffering from esophageal cancer. After he retired in 2006, he gave control of his Crystal Cathedral Ministries to his son, and the enterprise fell into disarray. A centerpiece of Rev. Schuller’s ministry at its height was the former Crystal Cathedral, one of the nation’s first megachurches, which is now the cathedral for the Catholic Diocese of Orange. Three years ago, the diocese finalized its purchase of Rev. Schuller’s landmark church in Garden Grove and the surrounding campus. Crystal Cathedral Ministries had declared bankruptcy in 2010, four years after Rev. Schuller stepped down, amid all the Schuller family infighting. Completed in 1980 at a cost of $18 million and built to seat 2,900 people, the cathedral is made up of more than 10,000 panes of glass. Now renamed Christ Cathedral, it had to undergo an extensive interior renovation to make it suitable for Catholic worship, and the surrounding property is being transformed to meet the needs of Orange County’s Catholic community. “We are blessed to honor his memory on the Christ Cathedral campus and to continue the mission of service, charity and evangelization begun here so many years ago,” Bishop Vann said. Rev. Schuller had his roots in the Midwest. Born on a farm in Iowa in 1926, he was raised in the Dutch Reformed Church and educated at two Dutch Reformed institutions, Hope College and Western Theological Seminary, both in Holland, Michigan. After graduating from the seminary in 1950, he became a pastor in Chicago. In 1955, Rev. Schuller turned his attention to Southern California and rented a drive-in theater for $10 to use for worship services on Sunday mornings. The Garden Grove Community Church, affiliated with the Reformed Church in America, grew thanks to his persistent door-knocking and newspaper advertising. The church found a new home in 1961, and in 1968 had the 14-story Tower of Hope built alongside it. Christ Cathedral also owns and maintains the tower. Rev. Schuller’s “Hour of Power” program debuted in 1970 and at one point in the mid-1980s, reached an estimated 7.5 million viewers each week. Rev. Schuller was invited by the former Soviet Union to appear on Soviet state television’s first religious broadcast in 1989. He soon afterward began recording a monthly program for Soviet TV. His fame was such that Rev. Schuller was invited by President Bill Clinton to the White House for a private prayer meeting in 1995. In 1996, he was invited by the Palestinian leader Yasser Arafat to a private meeting to discuss hopes for world peace.